Narciso is a fragrance inspired by the elegance of woods & the delicate femininity. 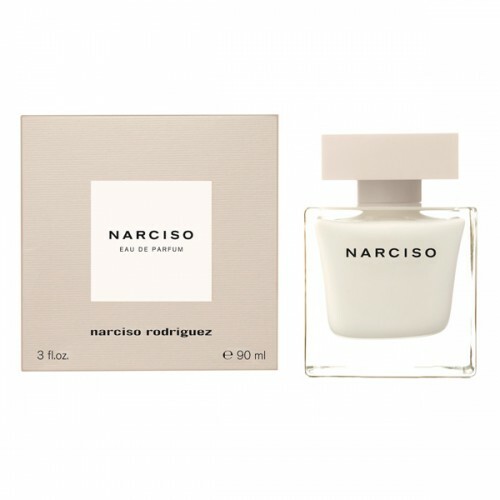 Narciso 90ml. Eau De Parfum - The smell of the mystery of the appeal. When the charm of wood meets the sophisticated femininity of a bouquet of white flowers. Narciso belongs to the group of woody, floral, musky fragrance. Top Notes: Bulgarian rose and gardenia Heart Note musk base notes: white and black cedar, vetiver. After the success of For Her, which was declined in all its forms and Essence, the other feminine fragrance, Narciso Rodriguez Narciso returns with a new fragrance. For his latest fragrance, Narciso Rodriguez chose to appeal to the Brazilian model. Accustomed fragrances, the top was the Love Face Chloe, Gucci by Gucci Eau Mega Viktor and Rolf, but also the eponymous fragrance Marni. And it is also an eponymous fragrance that this is, named after the first name of the creator. "Narciso is a name so unusual," said the designer, "and one can not help thinking about the Greek myth of Narcissus. There is so much history attached to the myth, which suggests so many romantic stories." For romance and love are once again at the heart of this fragrance, Rodriguez through which intends to celebrate the female attractiveness. Once again, the heart of the fragrance is musk. It is accompanied by notes of vetiver, amber, cedar, Bulgarian rose and gardenia. The bottle, square and white has also its own history, always romantic, reported again by designer: "The white color of the bottle has been designed to look like a stone I found on a shore Cyprus, when I visited the birthplace of Aphrodite."